The company, headquartered in North Carolina, US, said the move comes following the granting of approval by the Nucor’s board of directors for the construction of mill. Once the plant gets fully operational in 2022, it will be capable of producing 1.2 million tonne per year (mtpa) of steel plate products. The project is also expected to create approximately 400 full-time jobs, said a top official. “This investment is consistent with our drive to continue delivering sustainable, profitable growth and superior returns for shareholders,” remarked John Ferriola, the chairman and chief executive and president of Nucor. Leon Topalian, the executive VP of Beam and Plate products, said: “By building this state-of-the-art plate mill in the Midwest – the largest plate-consuming area in the US – we will enhance our ability to serve our customers in the region while also furthering our goal of meeting all the steel needs of our customers around the country. We expect to select a site for the new mill early this year. Our team is poised and ready to take the next step in advancing our position in steel plate products,” he noted. 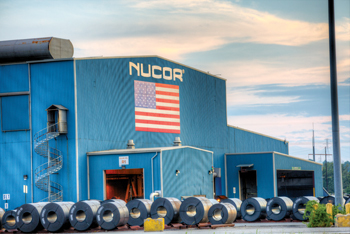 The new plate mill will produce cut-to-length, coiled, heat-treated, and discrete plate ranging from 60 to 160 inches wide, and in gauges from 3/16 of an inch to 14 inches in thickness; enabling Nucor to supply plate products that the company does not currently offer. The steel company currently operates plate mills in North Carolina, Alabama and Texas.